The effective use of climate data and products requires an understanding of what the statistical parameters mean and which parameters best summarize the data for particular climate variables. 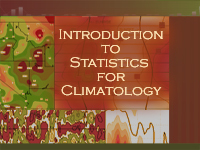 This module addresses both concerns, taking a two-pronged approach: 1) focusing on the statistical parameters (mean, median, mode, extreme values, percent frequency of occurrence and time, range, standard deviation, and data anomalies), defining what they mean and how they are calculated using climate data as examples, and 2) focusing on weather and climate variables, identifying the statistical parameters that best represent each one. The module concludes with a discussion of data quality and its impact on weather and climate products. The module is intended for forecasters and others interested in improving their understanding of the basic statistics used in climate products so they can make better use of climatology products for planning and operational purposes. Basic knowledge of meteorology is beneficial although not required. This module is part of COMET’s Climatology for Forecasters series. I thought it not only taught me the climate lessons but the Math. I would like for there to be some additional narration to this course, at times I need the understand the very basics. A vocal narration giving effective summaries aids me, rather than reading page after page. Interesting to know the climate formula etc.. It is well-explain and good to know its calculations. Useful lesson for those with little/no experience with the topics. For experienced individuals, not much useful information. Great for target audience or review. Need more time to review course contents. Nice and very interesting for novice like me. Very good learning tool for me. Learned climatology data and its relevance to current weather. GOOD LESSON NEED TO REVIEW. I LEARN MORE INFORMATIONS VERY USEFUL TO MY CAREER IN THIS LESSON AND MORE ESPECIALLY IN THE QUIZ. Learn a lot from this module as it is very informative. This is on the job educational training, work, and college. I was also a boyscout. a little dry...but not bad. Good module for the basics of statistics in meteorology. Like how it mentions why certain statistics are associated with specific meteorological variables. Module lacks media, audio, and video. Could keep with the same two cities for data examples, although it mostly does. 1. Define mean, mode, frequency of occurrence and time, extreme value, range, standard deviation, and data anomalies. 2. Using climate data, calculate each statistical parameter (other than standard deviation). 3. Understand which statistical parameters best describe various climate variables. 4. Describe the impacts of data quality on climatology products.